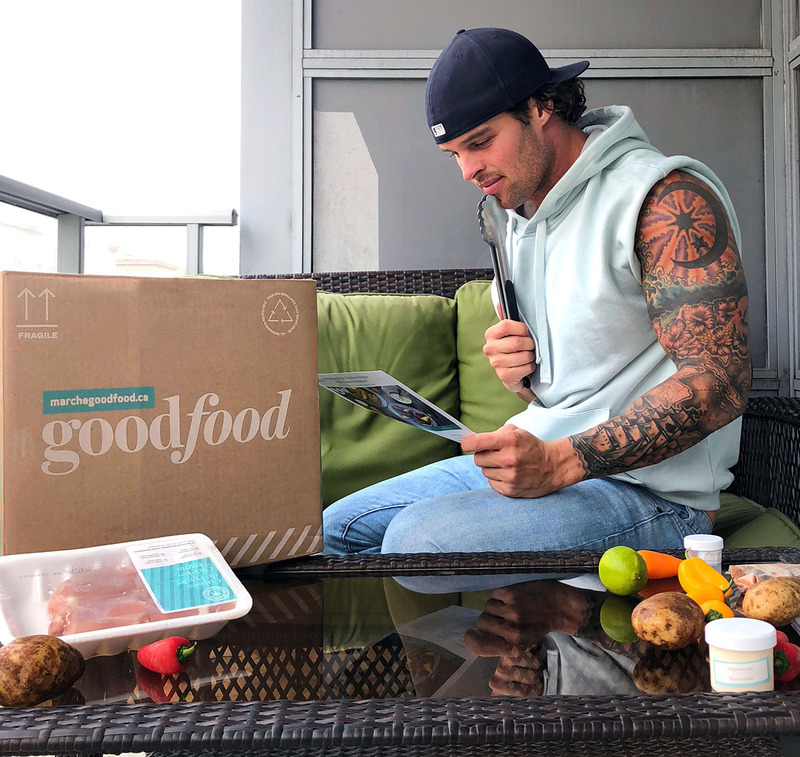 With summer quickly approaching, we just can’t seem to get burgers off our mind! 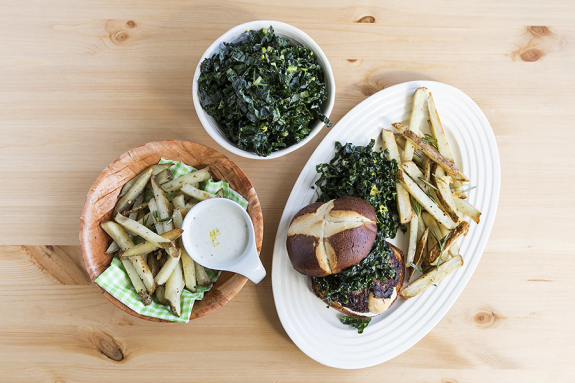 In this winning combination, we’re stuffing beef burgers with provolone cheese, topping them with citrus-infused kale and serving them up on our pillowy pretzel rolls. We haven’t forgotten the fries, but we’ve opted for the oven-baked variety, tossed with crispy garlic and rosemary and served with a homemade aioli. Preheat the oven to 450°F. Cut the potatoes into French fries. 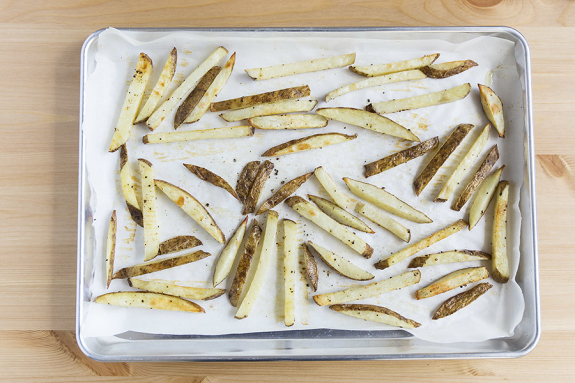 On a lined sheet pan, toss the fries with a drizzle of olive oil and S&P. 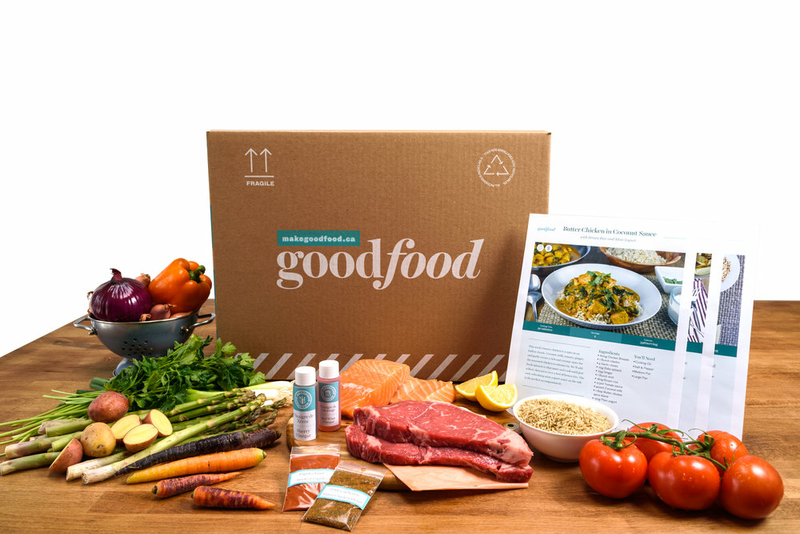 Arrange in a single, even layer and roast, stirring halfway through, 25 to 30 minutes or until lightly browned and tender when pierced with a fork. Remove from the oven and set aside in a warm spot. While the potatoes roast, zest and juice the lemon. Mince one garlic clove and thinly slice the other two. Pick the rosemary leaves off the stems. Mince the cheese. Remove and discard the kale stems; thinly slice the leaves. 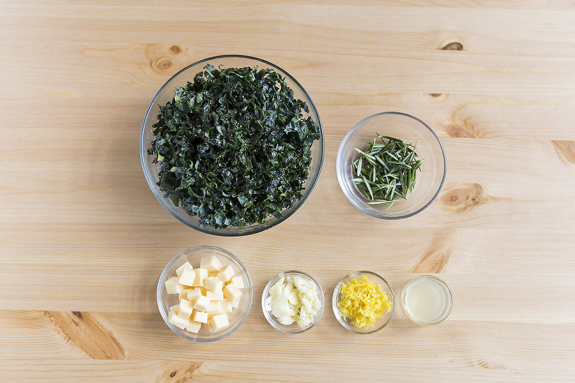 In a medium bowl, combine the kale, ¾ of the lemon juice and a drizzle of olive oil; season with S&P and mix well. In a large pan (nonstick if possible), combine the sliced garlic and a thin layer of oil. Cook on medium, stirring occasionally, 2 to 3 minutes, or until very lightly browned and crispy. 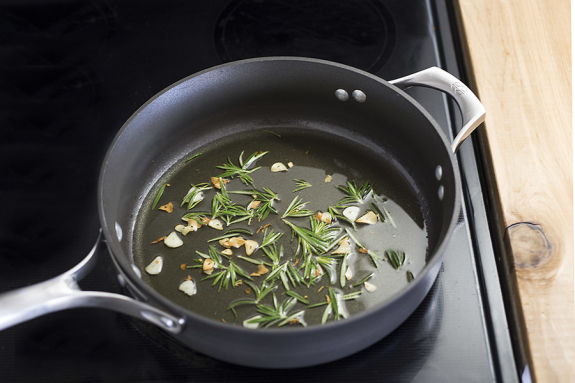 Add the rosemary and cook, stirring occasionally, 30 seconds to 1 minute or until crispy and fragrant. Leaving the oil in the pan, transfer the mixture to a paper towel-lined plate and season with S&P. In a bowl, gently combine the ground beef and lemon zest; season with S&P. 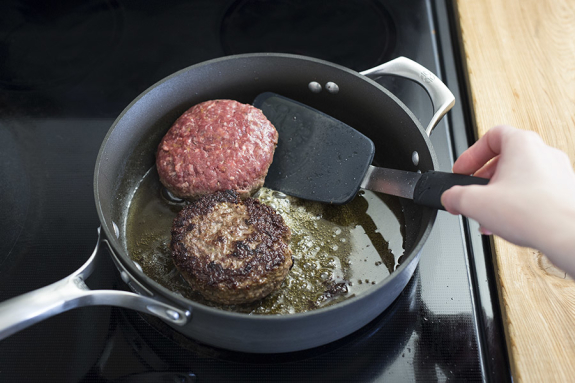 Using your hands, form the mixture into two equal-sized patties (double for 4 portions). 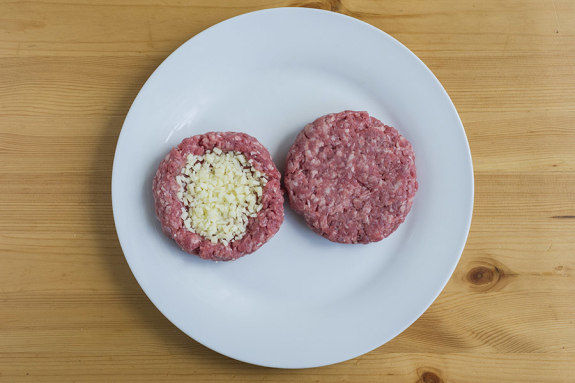 Form the cheese into two balls (double for 4 portions); place one ball of cheese in the middle of each patty and wrap the meat around it to seal in the cheese. Press down into the shape of a burger patty, making sure the cheese is sealed inside the meat. Heat the pan of reserved oil on medium. Add the burgers* and cook, 3 to 5 minutes per side or until cooked through. Set aside in a warm spot. Toast the buns cut sides down in the oven, 30 seconds to 1 minute, until nicely golden. In a small bowl, combine the mayonnaise, minced garlic and the remaining lemon juice; stir to combine and season with S&P to taste. Spread the aioli onto the buns; top with the burgers and kale. Garnish the fries with the crispy garlic and rosemary and serve on the side with the remaining kale. Bon appétit!